Home / Automotive / Cars / New Ford Fiesta St Is A Cracker! The hot hatch sector isn’t short of competition, with the Peugeot 208 GTi by Peugeot Sport and the new Toyota Yaris GRMN ramping up the level of focus on offer in this pocket rocket class – which means Ford has its work cut out with the new Fiesta ST. It boasts many technical innovations, but the car’s real trick is delivering a level of seemingly single-minded focus to serve up the requisite dynamic performance buyers demand from a R300,000 hot hatch these days without compromising too much how easy it is to live with. Chief among the engineering advances to achieve the first part of the above is the car’s new 1.5-litre three-cylinder turbocharged engine. It kicks out 147kw and 290Nm of torque (with an overboost feature to deliver a 20Nm hit like on the past ST) and with an optional Quaife limited-slip differential to help improve traction and launch control as part of the Performance Pack, it’s good for 0-100km/h in 6.5 seconds and 230km/h flat out. The move to a three-pot caused a stir, but the engine is strong, pulling sweetly from low down with a broad spread of torque and revving hard. However, where the old four-cylinder car used to bark higher up, this three-cylinder feels like it’s given its best by 5,750rpm. It makes a gruff note, enhanced for the first time in an ST by some electronic trickery. This ramps up depending which of the three driving modes you have selected (another first), which range from Normal to Sport and Track. In the latter two settings, the Electronic Sound Enhancement is supported by an active exhaust valve that introduces some overtly sporting pops and burbles when you lift off the gas. You now drive more using the torque but it’s still brilliantly engaging, while the six-speed manual’s short shift action draws you in even further. The powertrain package works in harmony with the chassis, too. Director of Ford Performance for Ford of Europe, Leo Roeks, said that his team has obsessed over the ST’s steering and chassis calibration. There are two different steering tunes – both linear ratio, but one for cars with that diff and one for those without – and both work sweetly. All Fiesta ST's get the torque vectoring by braking setup, but with that Quaife unit fitted, which only adds “between 800g and 1kg” to the weight of the car according to Roeks, traction out of turns is impressive. You can carry plenty of speed on corner entry, but be judicial and then squeeze the throttle and you’ll feel the diff lock as it tightens the car’s line, clawing at the tarmac to find traction and fire it down the next straight. That work on the steering has paid dividends, as there’s a welcome level of information, with only the faintest hint of the torque tugging at the steering wheel under power. The steering set-up is quick – the fastest fitted to any performance Ford yet – and is well matched to the level of grip the chassis generates. The front track is a massive 48mm wider than the previous ST, while bracing for the new, stiffer body shell means torsional rigidity is up by eight percent. The rear axle’s torsion beam is now thicker than before and controlled by ‘force vectoring springs’ and frequency dependant dampers with Ride Control 1 tech, while a new dual-compound sticky Michelin Pilot Sport tyre also features. The culmination is a car that turns in with more precision and aggression, grips harder and delivers even higher limits. Importantly though, the ST’s not lost its trademark sense of humour. With the ESC’s grip on the chassis getting progressively looser through the modes from Normal through to Track, this latter setting lets you play with the angle of the car, lifting mid-corner to help tighten its line and even indulge in a progressive and controllable slide. It inspires confidence to push harder. But it’s easy to drive it tidily, carving through corners such is the ST’s aggression to devour tarmac. The front axle feels nailed to your chosen line as long as you’re not wildly optimistic with entry speed, while the rear provides plenty of support. Those frequency selective dampers mean the harder you drive it, the more support and tighter control you get from the Fiesta. However, higher frequency inputs such as bumps and ridges (think motorway expansion strips) allow the dampers’ valving to open up to give more compliance and refinement. Together with those force vectoring springs that bear some of the sideways load, allowing Ford to soften up the rear axle bushes, it means the ST is now more liveable than before. 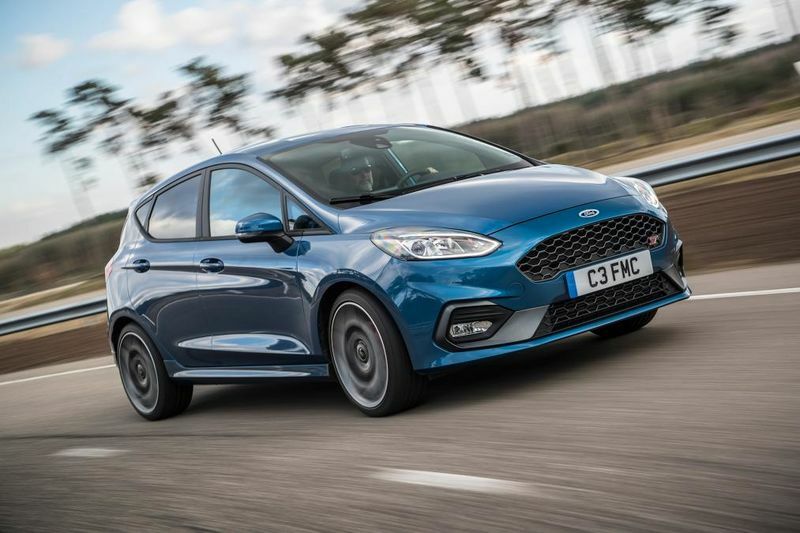 It’s available in three- and five-door body styles, while the 292-litre boot is unchanged over the standard Fiesta, so it covers the practicality bases a compact hot hatch should – another of which is efficiency.